Wow. All I can say is Wow. (Click here for FIFA match summary.) As Canarihnas just played the game of their lives against Germany (Check out Amanda Vandervort's article on them here). After a rocky start, in which Germany looked on path to beat Brazil at her own game in a repeat of the 2007 World Cup Final, Brazil came back from one down with a brilliant strike from Formiga (pictured here) and then followed up with a string of devastating attacks on goal - playing circles around the 2007 World Cup Champions to end the match with a decisive, and very entertaining victory (4-1). Brazil's defense looked awful at the game's start, and I'm going to say one of the plays of the match has to be a save from Tania early on - at about 2 minutes, she dug deep and literally extended herself farther than one would have though possible to get rid of a very dangerous cross headed right to the front of the goal, where Germany's strikers were waiting. Overall, in the opening Brazil's defense was harrowing to watch and they looked bizarrely slow. Meanwhile Bridget Prinz had her eye on the goal, and looked on pace to score. She's tall, and has a lot of physical presence - she's also lightening fast, and opened the scoring at ten minutes with a first rate run, out dribbling the opposition and taking the ball right up to the goal. It was a move right out of Brazil's own play book. My notes on this point: "WTF!?" That's a good "WTF", by the way, because it was a great goal - even if it made my heart sink. The game was a rough one (3 yellow cards for Brazil, 2 for Germany) - as was the case with their opening match, neither team wanted to let the other team find its rhythm. There were some scary moments - early on (around 6 minutes), as Angerer raced in to protect the ball she threw herself in the way of Daniela's raised foot - she took it flat on the chest. It looked like a 50/50 challenge to me, as Daniela had no right to expect Angerer's body to be there, and Angerer did get the ball - the latter is 100% fearless on this point, and has made some insane-looking challenges in the past (giving up a penalty in the 2007 World Cup to Marta - which she then saved). It's part of her strength as a goalie, she makes you think twice about taking the ball close. She took a minute, but got up and was right back in it. She is tough as nails. She was then making one stop after another - and as impressive as many of these saves were, I found myself thinking that if Brazil kept up this level of attack, it would only be a matter of time. The turning point of the match came at 43 minutes. Cristiane took the ball deep into Germany's half with loads of defenders on her - she nutmegged Stegemann and then made some highlight-reel worthy maneuvers around the defense - toeing and rolling the ball this way and that, to turn and send it right to the sweet spot in the middle: Marta, of course, was there (and marked). FIFA says she failed to connect - but this video suggests that she actually might have flicked the ball on (or not) - but an unmarked FORMIGA raced in and fired the ball into the net. Split between Cristiane (capable of shooting on target even when mark ed by two or three players), and Marta (ditto), and Formiga (there was no one left to mark her!) 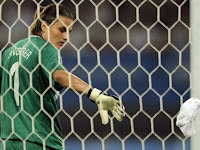 - Angerer was beat: For the first time in god knows how many minutes. I have come to admire and respect Nadine Angerer so much that a part of me was sad to see her unprecedented streak brought to an end. Her record of minutes played without conceding a goal will, no doubt, stand for years and years to come. Now - can I just say: I called it. Formiga! Not to take anything away from the twinned futebol goddesses Marta and Cristiane - but, as I've argued elsewhere, mid-fielder Formiga in many ways represents Brazil's strengths as a team. The talents of strikers like Marta and Cristiane are easier to measure in the very very limited space alloted to women's football, and you'll rightly see their names everywhere in coverage of the team's Olympic exploits. But with so little column inches given to writing about the women's game, we don't hear much about the John Terrys, Lilian Thurams, Petr Cechs, or even the Zidanes of the women's game. When I first started watching Brazil, I kept asking myself: What position does Formiga play? Because you'd see her clearing the line (as she did at least once in this game), playing well back, and then well forward - racing in to follow up the forwards, taking loose balls back and distributing. She is a very, very smart and fast player - with what I think they call "a great work rate." I would just love to have the stats on how many kilometers she logs in a match. I don't think she's called Formiga because she's tiny. I think it's because playing her is like being covered with ants. She moves like she's got eight legs and like there is a thousand of her. She drives you crazy because you can't get rid of her. She plays like an army of Formigas! Formiga: I am a fan! So, I practically wept when she opened up the scoring - and it's fitting that she should hammer home a fantastic team goal, too. Well - what else is there to say? Marta (getting past Stegemann here) and Cristiane (celebrating one of her goals here with a back-flip) put Brazil ahead with a classic collaboration - Marta takes the ball in close, draws one, two, three defenders and then slides the ball to Cristiane who exploits the space with a neat slide past Angerer. Later, Marta decides she needs a run and wants to score one too, so she takes the ball in close, beats the two defenders and with a tricky and risky little move she manages to get the ball just past an outstretched Angerer, using her left foot to do so. Cristiane puts the last nail in the coffin with her own attacking solo, beating four (yes, that's four) defenders before taking on and beating Angerer. Damn. I'm so happy to see Formiga & As Canarihnas get past Germany (who deserve much recognition for their recent performances - truly an amazing team). And if we see the US go through (they are playing Japan as I write this), there will be lots on the line in that gold medal match, as the US will be looking for its own payback for last year's semi-final World Cup loss, and Brazil, too, for their last Olympics final which they very narrowly lost to the US. Fisrt of all I wishe apologize about my poor English. I´m not sure I can express myself in your language. I reached your blog at random, but I liked it. There was a player, your name Garrincha, the most fascinant player in football history in my opinion. ( Not only in my pinion ). The europeans, like you, thought he was cocky and arrogant, and intented to humiliate the opponnents. These girls are not arrogants, or even confidents, actually, against the "powerfull" Germany, they entered the field insecures, just as in the first game. But their style derives from their enjoying on playing. sport too, it´s not only that. Football is for fun, for joy. Nice "jogadas" are so pleaseant as win, and much more beautiful. They are not cocky, Jennifer. They like to play, just it. None of them start on football seeing it as a career. see a girl playing football, and it´s still a quite unsual. It´s about malicius moves, the harmonic gesture, elegance and inspiration. Let the perspiration for all those sports without imagination. I only mean that when they play, and they are playing well, they are not afraid to show it - I play with people like this, wonderful people, who enjoy their talent. I will change the words to avoid any more confusion! Hi again - I changed the wording, and explained why in the original post. It is a translation thing. I mean moments like when Marta did a samba in front of a defender in the World Cup in 2007. They are better than most players, and when they are playing well, they show how much they love to play and enjoy winning. This is a good thing, especially for women who are not supposed to show this side. But he said something true. They were insecure, and i was insecure too. I lost all my hope when Germany scored, i almost cried. But didnt let us down. They won in a convincing, beatiful way. I'm proud of them now, they got better since the last world cup. Thank you for answer my post. was played, and so on. I noted you, much times, avoid the use of the word "soccer". are quite diferent too, I enjoyed pretty much read your column. as "arrogant", I just tried to say the reasons, in my opinion, why they seem "cocky" sometimes. could explain. Anyway,probaly you wouldn´t interested too. And I´m Writing it after an dolorous defeat to Argentina. she laughs, and made with the fingers that characterisc sign repensenting inverted commas, almost ashmed by the way she scored the goal. Because she knows... that´s not deserve to be called "bicycle". Sorry if my text seems don´t make sense sometimes or,in any moment, I sound rude. As I said, I don´t speak English, so, I don´t have any idea how my text really sounds. PS: Cibele, você é brasileira? Claro, só pode ser. Eu não imaginaria encontrar um brasileiro lendo esse blog perdido nos confins do ciberespaço. Mundo virtual pequeno, não é mesmo? Mas, a propósito, só mesmo a mulherada para nos dar orgulho, porque os marmanjos hein... que tristeza. yes - i think they were tougher this time. they seem better able to deal with the more physical teams? it was a rough start, but i think that made the victory even sweeter for me. watching them through this olympics has been such a joy! hugo - your english is fine! i love getting feedback from readers - how people understand my word choices matters to me, and it is important to know what doesn't 'translate'. i am flattered that people would read my blog even though it isn't in their mother tongue. i wish i knew portugese, because i would love to understand those interviews with the players. there is so much to say about the Brazilian women's team and how they play, and also about how the men are playing - and then there is the great difference between how the two teams are rewarded (as is the case with every women's team, but especially brazil, nigeria, and england). the men's team was at the opening match against germany. i kept wondering what they were thinking, and if they have much contact with the women players. 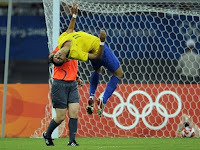 i know what you mean about the 'bicycle' kick - it was something else - also spectacular but in a street game/futsal way? spontaneous, improvised. she deserves the praise, even if it isn't a bicycle kick. thank you again for all the nice things you say about my writing. Hugo & Cibele - I am so glad you have met here. All languages are welcome! but, mainly, because you can understand a sort of things I supposed you could not. african team, more than by your own team, I pictured you just as some kind of sports fan, without deeper interests. I saw everything but I saw nothing, because I was blinded by my own prejudices. In part because is so hard for me to read in English. Almost too hard as hard for me to write in this language. tending to form simplified and stereotypical images about the things. I was in my mother´s venter. Maybe before. So far from the stereotype about you wich I formed, at very first moment and for no reason, in my mind. to exist in Los Angeles another person with the same feelings. that, besides Martas and Cristiane's interviews, you will love the literature and music. Esse time feminino me faz chorar de emoção, joga com dignidade, mesmo que perca, não faz a gente perder o amor por elas. O masculino é simplesmente corrupto! About being american, i can say. I lived in the US and met amazing people there. But other people sometimes have the wrong idea about this people, just like some people has the wrong idea about brazilians. This blog is a great space to talk about women's football. Just like me, Jennifer likes football and is a passionate about it. Also she's a feminist, so i'm really glad to here! And now Hugo came to talk about Garrincha, perfect. Garrincha made poems with his feet, i love it. And Jennifer, if you want any translation to anything in portuguese, just ask it! Sometimes they have great material about the girls in video. ESPN.com.br has a lot of footage about the girls. Formiga Is Just Just Just Great!!!!! I will want to be in a team with her, work rate, fantastic! She will be there with Marta, Daniele, Maycon andthe rest of the Brazilian Samba Team will pummel the team from the USA! Does Formiga have a Fan Club? Will want to Join! It was fair. USA has more chances in extra-time. To know to lose for to know to win. PS: By the way, "has or had"? "Had", I think. The USA team HAD more chances in extra-time. I think Brasil payed the price for your own incompetence. If you played in a 3-backs schema ( wich I dislike ) is expeceted the alas support the attack with quality. It wasn´t happen. unless Rodriguez was Messi or Romário, the usa´s attack has been advantage over ours defense. Nothing to complain, Brasil need to learn. If i can't complaint about what i think or express my feelings about the match, i no longer say anything. Me desculpe, mas você colocou a sua opinião e eu coloquei a minha. Longe de mim querer determinar o que alguém pode falar ou deixar de falar. Eu não sou censor de ninguém. Na verdade eu concordo em gênero, número e grau com tudo que você disse. Eu só acho que, se você me permite, não é a coisa mais elegante do mundo chamar o adversário de medíocre justamente quando se perde. Fica parecendo choro de mau perdedor, né? Agora, que é duro perder pra um timinho vagagundo desses, que fica todo lá atrás dando "bumba-meu-boi", espanando a bola pra onde o nariz estiver virado, ah isso você tem razão mesmo. bem preparadas fisicamente. As nossas meninas estão longe disso. Outra coisa, quem é esse tal de Jorge Barcellos? Alguém já ouviu falar desse cara? Que time ele já treinou, qual é o currículo, de onde esse sujeito saiu? O Renê Simões era um treinador de verdade. A primeira vez que essa seleção teve um técnico de verdade ela deu um salto enorme de qualidade, mas aí vieram os árabes com os petrodólares e o Renê saiu. Tudo bem, mas a CBF tinha que substitui-lo por alguém decente, não é pôr qualquer estudante de educação física recém-formado. Treinador é o que não falta no Brasil, todo dia um técnico de primeira linha é demitido no Brasileiro. Mas a CBF não quer pôr a mão no bolso? Ora, desse jeito tem mais é que perder mesmo. Por isso que eu acho que nós, mais uma vez, perdemos mais para a nossa própria incompetência do que para o adversário. Como sempre, em todas as áreas, esse país nunca aproveita o potencial que tem. Agora, você está certa: o futebol perdeu. O time das "robozinhas" ganhou. where did your comment about tonight's game go? i totally agreed with you! see my post. i was so depressed watching that game. it reminded me so much to the world cup final against germany. i am really glad you are reading this blog - i only posted for you guys, i was so depressed i wasn't going to say anything, but your comments encouraged me to express my disappointment. cibele - e-mail me at jennifer.doyle@ucr.edu if you want the text for your comments. they are really important, and i am sad you took them off. í´m anxious to seet the start up of the WPS games. I don ´t know whether will cheer for chicago or for the Sol. Perhaps I can get a few games by sportv or other satellite network from the US. Tell me one thing: who is this Miyama fm Japan how old is she? a terrific player. I ssee she was picked up by SOL. For the few minutes and moves I saw her playing - no doubt: with Marta by her side, the opponent sides will have a tough time. And the Sol supporters ots of amusement. Jennifer, no halting in yu writing, I wish to read more from you.